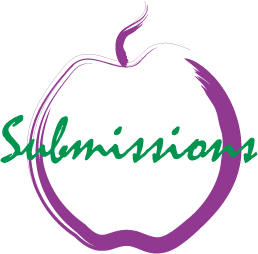 Thank you for your interest in submitting to Imitation Fruit Literary Journal. The journal is an annual online only publication. We look for fun and upbeat narrative content to publish in the journal. Deadline for submissions to the 2019 issue is June 16, 2018. Email up to 5 poems or 15 pages of prose to the link at the bottom of the page. Please send your text submissions as MS Word documents (.doc, .docx, .rtf formats) or cut and paste the document into your email. Please send graphics at a high resolution so that we can edit them for the web with the best quality display performance in mind. We can accept jpeg, gif and other common graphic file types. Please include a short contributor biography about you and your artwork or writing. If you have a website or current project that you want readers to see online, include a link and we will post it with your work if accepted. All rights to the prose and artwork posted on Imitation Fruit belong to the original creators. We will keep work that has been presented in Imitation Fruit in our back issues catalog so that the work will still be available to readers after the current issue. Please let us know if you would like us to remove your content from the back issues. We do not pay for writing or art used in Imitation Fruit Literary Journal. We do however encourage writers and artists to use the site as a way of promoting their work. Please click on the submission link and help fill our fruit basket!